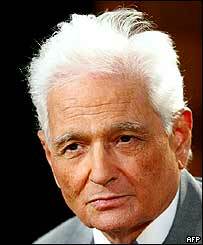 Jacques Derrida, one of France's most famous philosophers, has died at the age of 74. That did not mean that they understood what Derrida was on about though - as deconstruction is a highly complex, not to say obscure, school of thought, he says. At its heart is the notion that each word and by extension each text contains layers of meanings which have grown up through cultural and historical processes. A writer may not know it, but what he puts on paper has all kinds of other significance than the obvious and this can be "deconstructed" by the expert. Derrida, who was born into a Jewish family in Algeria, published his ground-breaking work in the 1960s and went on to achieve enormous influence in academic circles, especially in America. But in 1992, staff at Cambridge University in the UK protested against plans to award him an honorary degree, denouncing his writings as "absurd doctrines that deny the distinction between reality and fiction". Derrida also campaigned for the rights of immigrants in France, against apartheid in South Africa, and in support of dissidents in communist Czechoslovakia. He was so influential that last year a film was made about his life - a biographical documentary. At one point, wandering through Derrida's library, one of the filmmakers asks him: "Have you read all the books in here?" "No," he replies impishly, "only four of them. But I read those very, very carefully".